No. 7 Calvert Hall batted around twice, scoring 10 runs in the third inning and four more in the fourth, en route to an impressive 15-1, five inning triumph over Mount Saint Joseph in its MIAA A Conference baseball opener, in poor weather conditions, Monday at Carlo Crispino Stadium in Towson. 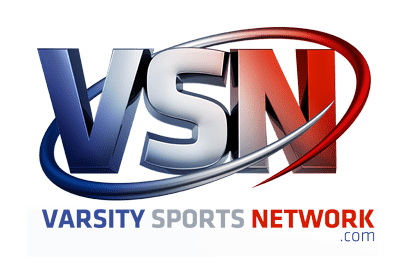 The Gaels were coming off a 5-0 win over defending conference champion Archbishop Curley last Wednesday, but they were no match for the powerful Calvert Hall lineup, that pounded out 12 hits against three St. Joe pitchers, in just four innings of play. Peter Marchineck, Calvert Hall’s starting and winning pitcher, put the Cardinals on top with an RBI single in the bottom of the first. St. Joe pulled even in the top of the third when Brad Howell drew a lead-off walk and moved to third on a single by Brad Kenjorski, with two down. Howell then scored when a pop fly off the bat of Justin Looney fell on for an error. The roof, however, soon caved in on the Gaels (4-2, 2-1 MIAA A). All nine Cardinals in the batting order came to the plate and reached base, with seven of them scoring, before the first out was recorded in the bottom of the third. The 4:30 p.m. contest started under the lights, with a game time temperature of 51degrees which fell to 43 in the wind and the rain, by the time the fifth inning rolled around. The weather, however, didn’t seem to affect Calvert Hall Marchineck, a senior lefty who stopped the Gaels on one hit in four innings of work to get the win for coach Lou Eckerl, who is gunning for his ninth conference crown. The Cardinals (4-3, 1-0 MIAA A) got some potent hitting from their second, third and fourth hitters in the lineup. Jose Torres, Parker Landwehr and Antonio Barranca were a combined 8-for-10 with a double, two triples and seven RBI’s. Barranca, a rising junior third baseman, had a double and a triple, with two RBI and a run scored in the same inning. Landwehr, a slugging senior first-baseman and catcher, who is Boston College bound, was 3-for-3 with two RBI’s and two runs scored on the day, and shortstop Torres, who is headed for North Carolina State after he graduates from the Hall, if he doesn’t get drafted and elect to play professional baseball, had a single, a triple, two runs scored and three RBI’s. Eckerl said that he was pleased with the leadership from the seniors that is coming through. “The last couple of games we didn’t hit as well as I know we can,” said Eckerl. “It was good to see those guys come to life today. We have a really solid lineup. one through nine, and I think we will be very competitive this year in the conference. The Cardinals were coming off a tough 6-4 loss over the weekend to Georgetown Prep, but Eckerl said they redeemed themselves today, when it counted, in league play. 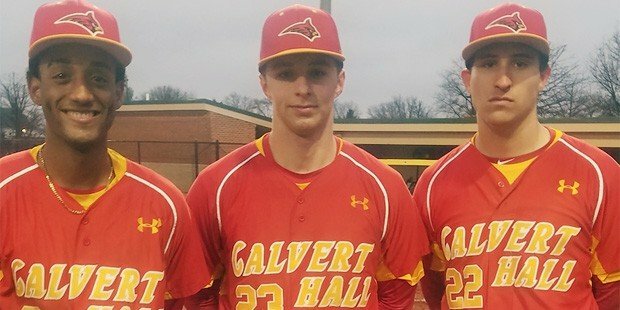 Pictured above: (from left) Alex Torres, Parker Landwehr and Antonio Barranca combined to go 8-for-10 with a double, two triples and seven RBI’s on a big offensive day for the Calvert Hall baseball team.